Are you discouraged with your present state of health and your efforts to restore it? Are you seeking a natural approach to health care but are confused as to where you should begin? The first essential step to restoring your health naturally and effectively is to know the critical details at the root cause of your health dilemma. Outside of emergency medical care, conventional medical testing has significant limitations for determining the causes of chronic illnesses and degenerative diseases. Though conventional medical testing and many alternative methods can provide some relevant findings about your health condition and symptoms, these typically do not lead to a concise understanding of all of the critical details at the cause. Just as often, medical testing can fail to note relevant findings entirely, despite indications something is wrong. It happens every day: People are handed “normal” test results only to suffer a heart attack or to be diagnosed with cancer soon after. However, cardiovascular disease, cancer and other health disorders do not develop overnight. It is a process of one annual physical after another of missing important critical details. For these reasons, it is extremely helpful to include other reliable methods of testing. This way these toxins can be revealed and addressed before serious health disorders develop. A skilled Kinesiologist can determine those details causing functional interferences (toxin-induced imbalances) that can eventually compromise and erode normal organ and immune functions to pave the way for disease processes. Kinesiology functional testing procedures operate much like the anti-viral software on your computer. It enables the doctor to monitor corrupted “programs” and “files” within the body’s “operating” system, the Central Nervous System (CNS). This is important, for it is the CNS that monitors and regulates all functions of the “hardware,” meaning the various organs, systems and structures of the body. Efficient kinesiology procedures can reveal important functional interferences responsible for altering “hardware” function and their impact on the whole system. Accessing the “software” enables the doctor to search and find these hidden critical details to the real cause(s) and the best treatment solution to help resolve health disorders. Kinesiology, however, is not actually a software program in itself that the doctor can plug in and set on autopilot. Kinesiology is only as effective as the level of knowledge and skill of the practitioner, which is why results can differ. Dr. L’Hommedieu’s proficiency in specialized kinesiology procedures provides an accurate and efficient method for uncovering those important details so often missed by conventional medicine and even other alternative methods. Chemical imbalances, nutritional deficiencies and heavy metal and chemical toxicities: These are just some of the toxins that can disrupt your health. Dr. L’Hommedieu’s approach to natural medicine identifies these toxins and many more. 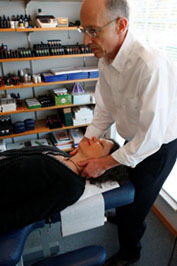 Even better, he then provides support that relieves your symptoms and corrects the imbalances they cause. 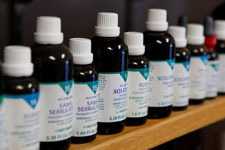 Dr. L’Hommedieu incorporates kinesiology functional testing procedures with an extensive compilation of test vials. With thousands of test samples containing nutrients, homeopathics, botanicals, foods, food additives, heavy metals, toxic chemicals and pesticides, *vaccines, *bacteria, *fungi, *yeasts, *viruses and *parasites, Dr. L’Hommedieu can help match the type of toxicity disrupting your health with the best nutritional and homeopathic solution for you. 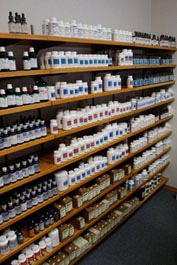 Only the most bioenergetically active herbals, homeopathics and other nutritional therapeutics are utilized. Obtaining high quality supplements is a priority that is necessary for achieving therapeutic results. All nutrition is tested and dosed according to your specific requirements, so you are assured safe and effective therapeutic results. Many people waste time and money with ineffective nutrition and treatments, but it does not have to be that way. Advanced Natural Medicine is based on synergistic nutritional strategies designed to deliver specific, potent and complete nutritional support to restore health, not just a band-aid to cover your symptoms. *Energetically produced equivalents. Vials do not contain live organisms. The Food and Environmental Sensitivity Assessment incorporates practical and efficient kinesiology procedures to evaluate possible reactive foods and environmental agents. The appropriate nutritional and/or homeopathic support is then recommended to help manage or neutralize reactive irritants and toxins. This can be followed with a noninvasive desensitizing procedure using microcurrent at specific acupuncture points serving as a biological reset mechanism to help down regulate an overactive immune response. Dr. L’Hommedieu’s approach provides a key advantage over the limitations of conventional food and environmental allergy testing. This noninvasive functional assessment monitors adverse neurologic test responses from food and environmental agents that are not only associated with known allergic reactions, but also those causing hidden functional sensitivities. Functional sensitivities are reactions that can appear as an allergic reaction, but do not induce the typical allergic-type immune response with the production of immunoglobulin antibodies and elevated white blood cell activity. Functional sensitivities are responses induced by foods having a therapeutic action specific to an organ compromised by functional interferences, such as heavy metals, toxic chemicals, vaccine ingredients and other agents. Essentially, the food provokes a compromised organ to detoxify even though normal pathways have been corrupted by toxins. For example, tomato could cause an allergic reaction due to an antigenic response to a protein sequence or a phenolic compound present in the tomato. However, it could also cause a functional sensitivity. Tomato is a liver mover, meaning it stimulates liver function. When a latent toxic substance stored in the liver is induced to purge it can result with symptoms such as red eyes, flushing, diarrhea, nausea, vomiting, labored breathing, tachycardia and other symptoms depending on what and where the toxin is. Such symptoms can appear as allergic reactions, but functional sensitivities are often absent of elevated antibody and white blood cell (WBC) responses. Many of the “allergic” reactions people claim to experience are actually functional sensitivities resulting from a toxic overload buried in their system. Do you know toxic metals and chemicals play a prominent role in the cause and exacerbation of every health disorder? Deeply entrenched within the cells of your body, toxic metals and chemicals interfere with normal cell functions and alter your metabolism. Dr. L’Hommedieu refers to these health-altering toxins as functional interferences. These toxic substances can increase your health risks as they weaken immune system defenses, hamper energy production, deplete vital nutrients and interfere with the normal function and development of your brain and nervous system. Heavy Metal and Chemical Detoxification is appropriate for many health disorders, especially those conditions where there has been a history of metal and chemical exposure from a work environment, chemical refinery, manufacturing plant, commercial agriculture, chemical and processed foods, toxic toys and everyday household products and vaccines. Unfortunately, conventional medicine has generally failed to acknowledge how toxic metals and chemicals are notorious for causing seizures and epilepsy, diseases of the nervous system, autism, behavioral disorders, poor concentration and memory, anxiety, depression, migraines, chronic fatigue, and are associated with lower IQ scores. As an example of this failure you can find a long list of “causes” associated with seizures and epilepsy, which are certainly legitimate. However, the last one on the list will typically be Idiopathic Causes, meaning the cause is unknown. Curiously, 60% of all seizures and epilepsy are idiopathic. Obviously some critical details are missing. Obvious, because when undergoing the detoxification process seizures are reduced to the point where they stop. Dr. L’Hommedieu is an innovator of intelligent heavy metal and chemical detoxification. He developed a comprehensive nutritional chelation approach that is by far more effective than IV EDTA chelation for most health circumstances. He identifies the specific toxic elements compromising your health and then designs a program individualized to your requirements. The comprehensive support and detailed monitoring ensures these toxins are removed safely from your system and not reabsorbed. Now you can manage these major road blocks to your health effectively and safely and eliminate disease-causing poisons from your system. This can be your best insurance for minimizing your chances of incurring serious disease in the future. An acupuncture treatment utilizes acupuncture needles, which are very small in diameter and normally well received by most patients. For those who prefer some of the benefits of needle acupuncture without the needles, sensation-free meridian therapy utilizing Mens-O-Matic or Alpha Stim microcurrent units can be substituted to stimulate the acupuncture points. Therapeutic Low Level Cold Laser is beneficial for accelerating healing processes associated with many types of injuries, wounds, post-surgical incisions, scars and especially burns. It can be very helpful for pain control and has many other therapeutic uses. Microcurrent Therapy assists in tissue repair of musculoskeletal injuries, pain control, and has special application for clearing reactions associated with food and/or air-borne sensitivities and allergies. Laboratory Testing is an additional method to further evaluate nutritional and metabolic imbalances of the patient. Laboratory blood and/or hair testing may be recommended depending on the type and extent of the health disorder being addressed. Test results can also serve as important base-line diagnostics to evaluate the progress of your nutritional program. X-Ray Imaging is utilized for assessing structural alignment and bone and joint integrity only when necessitated. X-Ray imaging is not performed on premises. The initial musculoskeletal exam and chiropractic adjustment take approximately 1 hour. This includes a history relative to the primary area of concern, a musculoskeletal examination and adjustment that may utilize kinesiology testing. The basic fee is $95. Additional therapeutic modalities such as acupuncture, microcurrent, low level cold laser and other services are $25 each. Fees for x-rays and laboratory testing vary depending on types of tests ordered. Follow-up chiropractic adjustments take approximately 15 to 20 minutes. This includes monitoring progress and chiropractic adjustment that may utilize kinesiology testing. The basic fees range from $40 to $60. Additional therapeutic modalities are $25 each. Nutritional testing is an additional $25. The Basic Nutritional Assessment takes approximately 50 minutes. This provides wellness nutrition support for those who desire some limited nutritional support, but are unsure which nutritional supplementation is right for them. This includes some basic testing to note deficiencies, addresses one minor health issue, and critical dietary suggestions. The fee is $85. The Wellness Nutrition and Toxicity Assessment takes approximately 1½ to 2 hours. This includes a comprehensive medical, dietary and nutritional supplement history and a Toxicity Questionnaire. There is a kinesiology toxicity assessment of the major organs and their systems, thyroid and adrenal function, metal, chemical and microbial toxicities and critical food or environmental reactions. An individualized nutritional program and important dietary and lifestyle recommendations are provided. The fee is $150. The in-depth Food and Environmental Sensitivity Assessments may be included for an additional fee: $25 for 15 test samples or $50 for up to 40 samples. Fees for x-ray imaging and laboratory testing vary depending on the types of tests ordered. Follow-up treatments range from 20 to 60 minutes or more. The basic fee for children 5 years of age or under for the treatment of minor acute illnesses taking approximately 15 minutes is $35; the basic fee for treatments taking approximately 30 minutes is $55; the basic fee for treatments taking up to 60 minutes is $85. Additional therapeutic modalities are $25 each when required. Phone consultations are 30 minutes. The fee is $45. In office consultations are 20 minutes. The fee is $35. *Dr. Stephen C. L’Hommedieu accepts Blue Cross/Blue Shield and Medicare. Medicare coverage is limited to chiropractic adjustments and physical medicine therapies only. *The cost of all nutrition is additional.